The physicians on our medical staff and our entire team are dedicated to making every patient feel welcome, comfortable and well cared for. Our facility is licensed by the State of New York as an Ambulatory Surgical Center, certified by Medicare, and accredited by the Accreditation Association for Ambulatory Health Care (AAAHC). Services offered include anesthesiology, bariatric surgery, breast surgery, colorectal surgery, general surgery, gynecology, ophthalmology, orthopedics, otolaryngology (ENT), plastic surgery, podiatric surgery, urology, and vascular surgery. 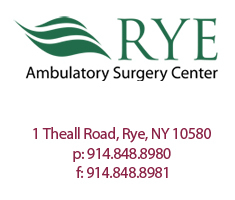 If you have any questions about your surgery or procedure, please contact your physician or the Rye Ambulatory Surgery Center at 914-848-8980. E-mail your physician, request prescriptions and referrals, make appointments, pay bills online. Copyright 2017 Rye Ambulatory Surgery Center.